Home » Blog » Final Move Update: It’s Done! It’s been about a month since we last let you know how our move was going. To get you up to date, we’re moved, we’re unpacked, and we’re up and running at full strength. We’d like to take this opportunity to thank you for your patience, understanding, and support while we took on this challenge. We certainly increased our capacity. Our old facility, our home for nearly fifty years, grew from a single building to three. Between the three buildings we had about 24,000 square feet. Roughly, one third office space and two thirds warehouse space. It was a great building, but we had outgrown it. There was no more room for new people, new products, or new equipment. Our new facility is almost 75,000 square feet. We were excited about the new space, to be sure. We expected to have more space for all the things we need to do, like adding new inventory, equipment, and hiring more people. What we didn’t expect was how quickly it would change our thinking. 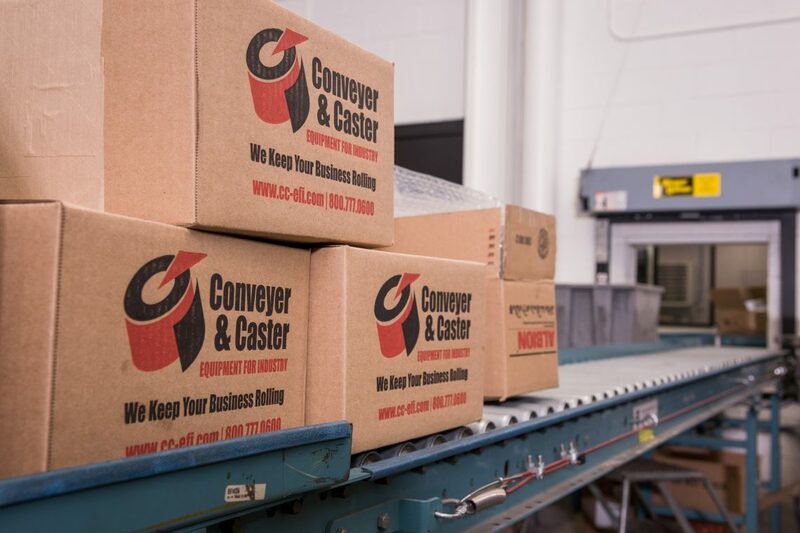 Jeff Stohr, CEO of Conveyer & Caster said the other day, “we used to think of reasons not to take on a challenge and they came easy, ‘We don’t have the space’. But now, I’m looking in our warehouse and asking myself, ‘Why shouldn’t we?’!”. The truism “more isn’t always better” certainly holds true for business space. After taking possession, we worked to make our new space the best space we could. We cleaned and painted, upgraded the lighting (it’s mostly LED now), rebuilt conference spaces, added some great technology, and created open, communal, cooperative spaces that encourage communication and community. One of these spaces was a common lunch and working area in our offices. Movable, high-top tables serve as cafeteria and conference space. We’ve compiled a video and photo tour of our facility. We’d love for you to take a look and experience what we experience every day now. We’re incredibly proud of the efforts the whole team made to make this happen. We had the help of some excellent contractors, too. Thanks again for your patience, understanding and support. This is our new home. We’re proud of it. Graphics of our organization’s history welcome guests into the office. They help tell our story. Our interior lobby provides ample space for conversation. Many offices have standing desks, so does our main conference room. Terry, an outside salesperson, works at his new station. Mobile whiteboards create separation and useful working walls. Our aCCEL Board Room offers quiet, secluded meeting space for important conversations like employee reviews, executive meetings, and strategy discussions. Smaller meeting rooms feature standing tables and glass white boards to encourage cooperation and collaboration. Training our team, en masse, presented logistical challenges. Not anymore. The Albert T. Stohr University Training Room has ample space. Our new warehouse makes storage and retrieval a breeze. Our warehouse forklift fleet is electric, making our operations cleaner and quieter. An open, clean, bright, climate controlled assembly room helps our production team love their jobs. Workbenches include ergonomic features like tool-balancers and floor matting. Assembled casters are easily put into totes on the shipping conveyor. Totes flow on a lineshaft style powered-roller conveyor to our parcel shipping station. Orders are packaged and shipped to our customers with minimal lifting and bending. Sometimes lifting and bending is good, too. We encourage that with our workout facilities. …or simply enjoying the company of our co-workers. We work to foster a family environment.